Over the last few years since I fell into the way of drinking loose leaf teas I have tried three online vendors that I have purchased teas from. The first actually had a physical branch store open about 100 miles from me for a while before the branch store went under. There was nothing like walking in there and sniffing at all the wonderful teas. This was TeaVana. I currently order from their online website. http://www.teavana.com In general they seem to have high quality products. Their pricing is a little steeper than the other two sites I have purchased at but they have some to die for teas. From Teavana there are a few standout teas that rate our highest rating. They are teas that we come back to time after time and drink more often than other teas. Almond Biscotti Black Tea This a black tea that tastes exactly how it sounds. Be carefull brewing it, or it will turn bitter on you. 1 to 1.5 minutes is all the brewing time you need. Store Description A black tea with the scrumptious “cookie-like” flavor of almonds and cinnamon bits, especially tempting sweetened with rock cane sugar and a splash of milk. For the most part those are the teas we like the most from Teavana.com.. there are a bunch of highly rated ones we have not tried because of the prices though. These teas average in the 6 to 8 dollars per 2 ounces range. Some of their teas jump as high as 20 dollars per 2 ounces and we tend to be a bit cheaper in the pocket book than that. Chocolate Chip Truffle I very much liked this tea from the first time I tasted it a few days ago. It’s in the 4.50 dollar per 2 ounce range. Store Description. A signature black tea blend, Chocolate Chip Truffle black tea, is a decadent mix of deep dark chocolate chunks mingled with rich black tea leaves. Vanilla Bean This was the second of three teas I ordered from here and it was also very nice. Vanilla Bean, a deep blend of black tea leaves with Madagascar vanilla, conjures up images of inhaling the heady aroma of wild vanilla as you hike the tropics near Mt. Maromakotro. A full-bodied and fruity cup, Vanilla Bean, a blend of Ceylon and China black teas, makes a deeply satisfying impression. Chocolate Mint Truffle Roobios This was another very nice tea. Blended with Rooibos tea, an herbal plant also known as Red Tea from South Africa, Chocolate Mint Truffle rooibos tea is an intoxicating blend of chocolate cacao nibs, mint and rooibos leaves. Rooibos and chocolate are both known to be good sources of antioxidants. Enjoy this guilt-free indulgence, great for kids and adults alike. These are the only teas I have ordered from here but they all were of a very decent quality. I am impressed that of the first three teas I ordered I like all three as much as I have. I recently ordered a bunch of teas from this website. They were very inexpensive compared to the other sites so I went wild and ordered a bunch of them. My results have been mixed. Some of the teas just don’t taste good at all. However some of them were very good. As I go through them and find which ones I like I will post comments and links here. Orange Cream Roobios Tea We really like this tea. Reminiscent of an orange cream-sicle, Orange Cream Rooibos Tea doesn’t need any sweetening to make you smile. Superior grade rooibos with orange peels, freeze-dried yogurt pieces, and flavoring. Caffeine-free. Use 1 tsp. per cup and steep 5-10 minutes in freshly boiled water. Monk’s Blend Tea I ordered a free sample of this with my order and it has gone to the top of the order list.. Very nice. Originally, it is believed that Monk’s Blend was developed by monks to support their life’s desires as tea is an item that these monks considered good for the soul. The monks would drink this tea to help keep them awake during long periods of meditation. It is fair to say that this is an ancient and harmonious blend that we can still enjoy today. Our Monk’s Blend is a perfect all-day treat; sweet and toasty with a subtle bouquet. The high-grown Ceylon used in this blend goes well with the smooth flavors of vanilla and grenadine. Enhanced with sunflower and calendula petals. Use one teaspoon per cup and steep 3-5 minutes in freshly boiled water. Cafe Latte Tea This sounded interesting and has lived up to that expectation. It is a cross between a black tea and coffee with a twist of chocolate. Even if you’re not a coffee fan, you’ll enjoy this blend first thing in the morning. Cafe Latte Tea contains black tea, broken cocoa bits, almond brittle bits, coffee beans, flavoring, and freeze-dried yogurt pieces (contains dairy). Great with milk and sugar! Use one teaspoon per cup and steep for 3-5 minutes in freshly boiled water. A great coffee alternative. We have found these to be the most used tea brewing accessory that we have. They are simple and work over and over, unlike the tea brewing bags we started with. They are just one of those simple but totally useful products you run across sometimes. We typically put the correct amount of loose tea in the filter and set it into a mug, then we add sugar if your so inclined and add hot water and brew for your preferred time. While brewing the lid/cap that you can see under the filter in this picture goes on top and helps hold the heat in as the tea brews. Then you turn the cap upside down and set it on the table and when you pull the tea basket out it sits in the cap as shown in the below pictures. 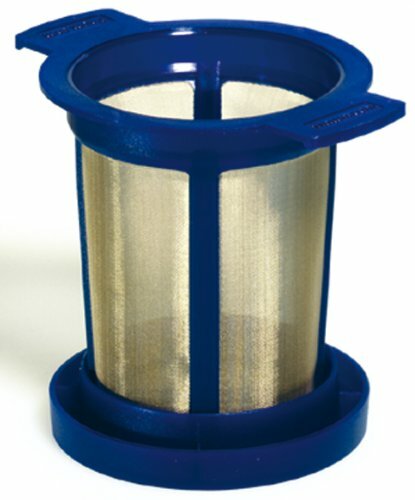 No muss no fuss, any excess water and tea that drains out of the filter stays in the lid. The filters are also very easy to clean by hand or in the dishwasher. If you clean them before the tea dries in them, as in leaving them overnight, then a simple rinse under the fawcet after you dump the majority of the used tea leaves out in the trash is sufficient. If you do let the tea dry out in the filter then dump what you can out and run hot water over it for a minute or so to soften the dried leaves. Then just gently rub the side of the filter with your fingers while running water over it to dislodge and clean the rest of the leaves out. We have purchased several sets of these so that we have them at the house and on our boat. We have also given some as gifts. Everyone loves them. With the high quality stainless basket they leave no taste other than the tea itself in your tea. We have been using these now for a couple years and are still using the original ones. The have held up to daily use very well. The link below to Amazon will take you to where we ordered ours and you can see other peoples reviews as well.